There are times when every one of us experiences difficulties – loss of a loved one, illness, spiritual crisis, separation, loneliness, job loss, discouragement and many others. God never intended for us to go through these experiences alone. That is why we are brought together as a parish. It is why pastoral care is a vital part of who we are at Saint Patrick Catholic Church. The purpose of pastoral care is to build community by the spread of the Gospel through acts of caring and mercy. When our church serves those in crisis, they tend to remain and find a home in our church. Conversely, we lose them and the grace of their presence if they do not find compassion here. We are diminished as a parish by the loss. To increase Saint Patrick Catholic Church’s ability to provide this critical pastoral care, our Pastoral and Finance Councils adopted a highly successful, ecumenical pastoral care model called Stephen Ministry in early 2016. Stephen Ministry equips lay parishioners to provide one-to-one Christian care to people in our parish and community who are experiencing difficulties in their lives. The program equips God’s people for ministry by providing 50-65 hours of training and ongoing support. The first step was to send two lay leaders to learn the Stephen Series system for pastoral care so that they can establish and maintain Stephen Ministry in our parish while teaming with existing ministries. Anne Chambers and Penny Melton represented Saint Patrick Catholic Church at a mid-April 2016 conference in St. Louis, Missouri. They returned with the tools needed to direct the training of Stephen Ministers. The parish prayed for travel mercies and a fruitful outcome for our parish. The first cohort of Stephen Ministers were trained starting August 2016 through the end of February 2017. The Stephen Ministers were commissioned and started to take care receivers in March 2017. Three people serve as Stephen Leaders working under Laura Dougherty, Pastoral Assistant for Pastoral Care. They teach the classes, interview prospective trainees, support Stephen Ministers in the field, and collaborate with Laura on the best ministry option available for individuals seeking assistance. Some who call Stephen Ministry are directed to community resources that more appropriately meet their needs. All callers are given careful consideration regardless of religious affiliation. Your Stephen Ministry team has recruited, interviewed and welcomed 11 new Stephen Minister trainees. Included are 8 women and 3 men. Of these, 1 each is from St. Rita of Cascia, St. Charles Borromeo and St. Leo Church (formerly a parishioner at Saint Patrick Catholic Church). They began training in October 2017 and completed their work at the end of April 2018 and commissioned on May 19 – 20, 2018 at Mass. Once commissioned, care receivers are assigned. The first group of Stephen Ministers has received 50+ hours of training and continues to be assigned care receivers as needed. They meet on alternate Tuesdays for continued education and peer support. Each case is reviewed without breaking confidentiality. A prescribed protocol is followed in which to ask questions, provide encouragement, spark discussion and make suggestions. As long as a Stephen Minister is serving in that capacity, peer supervision and continuing education is required. There are no lone wolves working without connection to the parish. How Long Does a Stephen Minister Work with a Care Receiver? The length of each caring relationship has varied from one week to five months as of this writing. Stephen Ministers are there for the long haul as is appropriate. The Pastoral Assistant for Pastoral Care very compassionately manages funerals and writes personal notes of condolences to parish families who have suffered the death of a loved one. This will continue. In the past, our parish has also sent out a book on dealing with grief. Stephen Ministry is going to take this on in a new way. We are adopting a series of books titled Journeying through Grief, published by Stephen Ministries, St. Louis. A set of four short paperback books is sent to grieving people, one at a time, at four critical points during the first year after a loss. Stephen Ministry volunteers will organize the books, keep track of the dates for mailing to each individual, and gather feedback. These books are like an unexpected hug reminding the receiver that their faith community at Saint Patrick Catholic Church cares. Be aware of those around you who are suffering for any number of reasons. Introduce yourself and provide one of the information cards available in the pew at Church and in the Gathering Space. 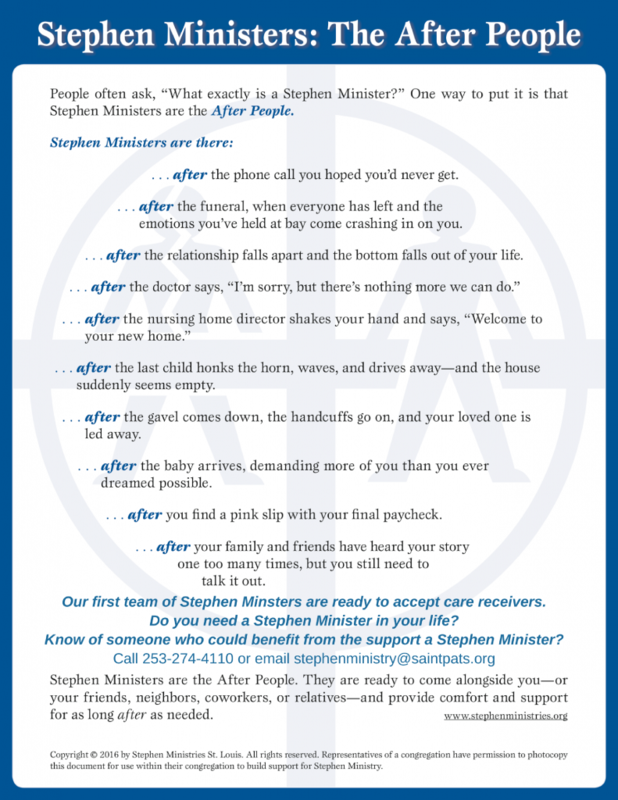 Do You Feel Called to be a Stephen Minister? Does Stephen Ministry sound intriguing? Could this be a ministry that taps into your spiritual gifts and passions? Are you a caring and compassionate listener? Would you like to join others who have layed the groundwork for this amazing outreach? Have you have been trained as a Stephen Minister, Cabrini Minister or similar calling in another church? Your Stephen Leadership Team— Penny Melton, Anne Chambers and Dan Skeldon are ready to answer all of your questions. I want to be a Stephen Minister!